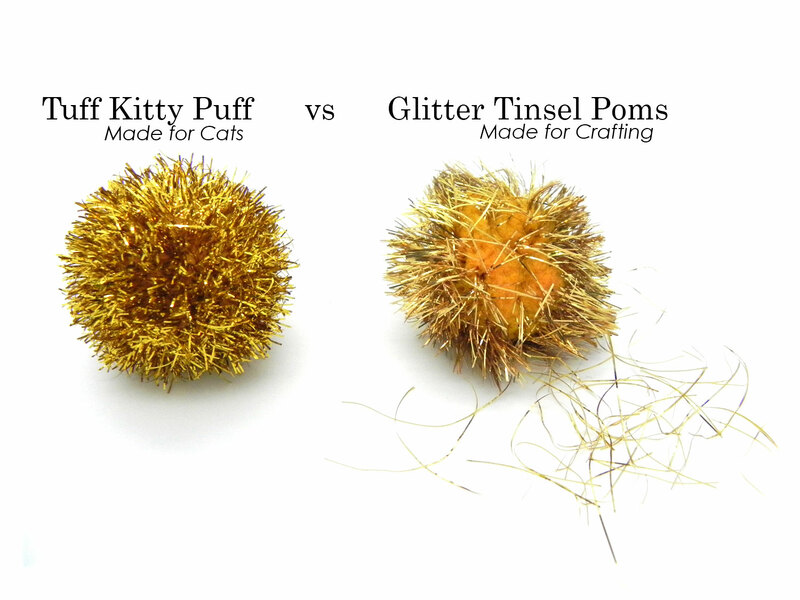 Tuff Kitty Puff® Sparkle Ball Cat Toy! Does your cat play rough and tough with their toys? Do you go through the basic sparkle ball fast? Then you need to try these TUFF Kitty Puffs®. This tinsel, glitter or sparkle ball is what started it all for us. This is THE Cat toy our Kats'n Us staff will play with year round. Even sleep with! it is the ultimate in TUFF sparkle balls. The sparkle ball we offer on our site is made specifically for cats. The colorful yarn and tinsel is tightly woven together to endure the hunter instinct and playfulness of your cat. Cats can play for hours with this toy. But there are those cats that play hard and can easily tear up a simple sparkle ball. Even the craft type tinsel balls are hard to keep up. So we did some researching and discovered this kitty puff had disappeared but was not forgotten. We decided that it needed to be reintroduced and be a part of our new collection of classic and retro Cat toys. The TUFF Kitty Puff® comes in assorted brilliant colors in very tightly woven yarn. Colors range from Blue, White, Gold, Green, Red, Dark Pink. This standard size cat toy is 1 1/2 inches in diameter. Cat Owners today are in search of classic toys that their cats love the best. Usually it is the toy their cat played with as a kitten, or it is that old favorite toy that brings out their natural hunting instincts. Some of these favorites of yesteryear have been phased out and replaced with faux fur, dyed fur or products that fall short of durability. “It is amazing how the cats know the difference” says Sue Lyster, Owner of Kats’n Us®. After years of field testing toys of all kinds,we discovered that our best sellers were the Sparkle Ball, the Natural Rabbit Fur Mouse, and the Natural Rabbit Fur Pom Pom. We realized these old time cat toys were not only durable, but also great for bringing out cats natural hunting instincts, and proven to increase activity and exercise. “ These toys have been around a long time, it would be a shame to see them disappear.” says Sue Lyster. The official launching of Kats’N Us® new retro cat toy collection will include such nostalgic favorites as the natural Rabbit Fur Mouse, the natural Rabbit Fur Pom Pom, the Jumbo Sparkle Ball, and the Kitty Puff. The Rabbit fur toys are made out of 100% real rabbit fur, no dyes or chemicals. 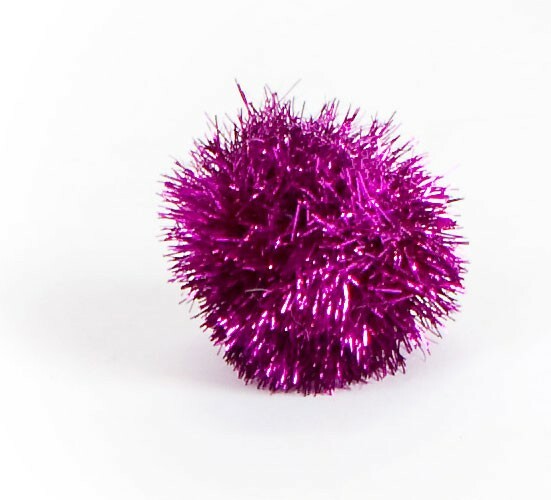 The Tuff Kitty Puff and the Jumbo Kitty Tuff Sparkle Ball come in assorted brilliant colors in a tightly woven ball for durability. I can find tiny sparkle balls, and huge sparkle balls. I can find sparkle balls that fall apart quickly. These are the only sparkle balls that not only last but are the right size -- just about 1 1/2 inches. These are the ones my cat likes to "catch" and carry around in his mouth like a dead mouse. Unfortunately, they're out of stock at the moment, but as soon as they're back, I'm buying more. My cat absolutely loves these toys! And I love their durability! Great buy. The only toys she's ever shown interest in are these sparkle pom toys. After searching many sites since my local stores do not carry them, I came across this one. I'm glad I did! Thank you so much Kats 'N Us. You've earned yourself a long-term customer! I compared with those sold at our local Hobby Lobby....yours was the best quality bar none. Cats loved them too. The sparkle balls have disappeared from pet shops and pet supply stores. I found some sparkle balls and I was thrilled, but they were of a different quality, and the first one Marcie played with ended up "gutted" on the floor from her claws when she grabbed it to play with it. These new sparkle balls are the original sparkle balls that I had been searching for and now we are finding these balls all over the house and IN ONE PIECE! Yeah! You found the original sparkle ball!! Marcie loves these - they are truly her favorite toy. This ball is so durable and tough, so glad to see it back on the market, Thanks Kats'N Us!